It’s only been a few days since President Trump returned from his historic groundbreaking face-to-face meeting (in Singapore) with North Korean dictator Kim Jong-un and already the media hysteria is in full-speed-ahead mode regarding what Trump gave away and didn’t receive in return from the rotund cheese-loving communist strongman. Such negative interpretations are understandable from liberals – it’s what they do, namely find fault with everything Trump does and refuse to concede any ground lest the American public get the impression that our president actually knows what he’s doing and is performing well on the job. No, a good amount of the criticism is coming from conservative circles – or at least neoconservative circles, many of them #NeverTrumpers who feign eternal unhappiness despite plentiful signs of prosperity at home and peace abroad. These nattering nabobs of negativism saw the glass as half-empty after Trump’s glowing post-summit press conference (where he even joked about condos along North Korean beaches), figuring Kim got the best of the much more seasoned American negotiator over twice his age. 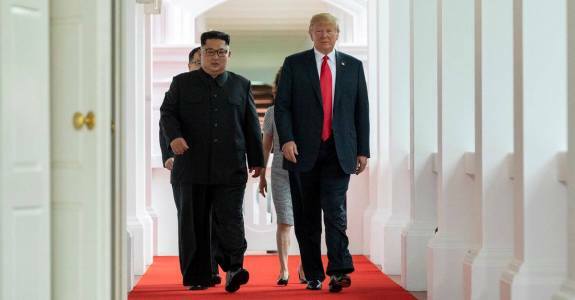 As an example The Editors of National Review wrote, “The buttering up of Kim would at least be a little more understandable if he had made major concessions at the summit. The meeting was initially billed as the moment when Kim would perhaps commit to complete, verifiable, rapid denuclearization. Instead, he produced more of the same — vague assurances of disarmament — in exchange for American concessions. Read this over and you’d almost think the writers are claiming Trump the naive trained circus monkey played his organ grinder well in Singapore but unwittingly allowed the fat Asian kid to get in for free and then make off with all the change from the collection can. Keep in mind this is a conservative publication (National Review) advancing these observations, staffed with thinkers who would theoretically tend to support a Republican president and his mission to protect the United States from the catastrophic effects of a future nuclear war. No one minds a few contrarian observations but this goes a little far beyond constructive criticism into the realm of elitist condescension. Taking each of the editors’ points in succession, why does anyone presuppose Trump’s meeting Kim Jong-un in person and treating him well necessarily translates to “legitimizing” the dictator? Would a better final result have been achieved if Trump served Kim a plate full of North Korean cockroaches and threatened to waterboard him on the spot until the 35-year-old agreed to immediate and irreversible denuclearization on the neocons’ terms? The truth is Kim didn’t enjoy any more “legitimacy” on Wednesday (the day after the summit) than he did the day before. It’s unlikely Kim will gain any additional American pals because of his chat with Trump, though more leftist Hollywood celebrities might now feel empowered to hang with one of the few remaining commie totalitarians on earth. Where’s Sean Penn? Second, who’s to say Trump agreed to “denuclearization” on North Korea’s stipulations? Any halfway intelligent person knows if you don’t have a meeting of the minds as to the terms of a contract there is no agreement. Kim can think what he wants, but the United States still possesses almost all the cards in this matter and if Kim wants to hold onto his little tinpot dynasty he’d better come to the table with sincerity. Donald Trump isn’t someone to cross – so “playing the fool” isn’t a wise strategy for the North Koreans. Lastly, what’s the big deal in Trump offering to end joint military maneuvers with South Korea in order to build a foundation of trust with Kim? Are these “war games” really necessary after 70-plus years of mutual antagonism? Haven’t all the possible battle scenarios been endlessly pored over for decades? “War games” are scarcely more than expensive flexing of military muscle, mere stage shows that really aren’t all that apart from Kim’s grand military parades and reviews. Completely getting rid of them puts neither side at an advantage nor disadvantage. And most importantly, wouldn’t Trump have been given the green light (preapproved?) by the South Koreans before agreeing to any of this? (And if not aren’t the South Koreans capable of defending themselves against conventional attacks?) Why is the United States solely responsible for protecting the region against Kim’s threats? Trump’s America First philosophies mandate these types of responsibilities will no longer be indefinitely assumed by the U.S. alone. It has to end somewhere, sometime. Why not now? One of the biggest benefits from Trump’s new “we’ll talk about anything with anyone” foreign policy philosophy involves ditching the old attitudes concerning the United States’ role in the world. Not only must countries like South Korea and Japan be more answerable for their own security, the political leaders of the United States must be willing to let go of the notion that only the American military is capable of standing up to a thug like Kim. Legitimacy for Kim? Give away the store? Not exactly. What’s the basis for this view? How could anyone who wasn’t actually sitting next to the participants and overhearing their conversations be so sure about who played whom? For those observing on TV it looked like Kim was the one out of his element – and why shouldn’t he be? Trump has a lifetime of experience traveling the globe talking with powerful people about important subjects. Kim resides in a virtual bunker with guards charged with protecting him from internal threats and from his own people. A coup is a constant danger in North Korea – is it here in Washington too? Kim’s the one who’s in the inferior negotiating position. What could he possibly ask from Trump or the United States that he’d be in position to demand from a standpoint of strength? If Trump concedes anything it’s because he feels like it, not because Kim compels it. Nuclear deterrence is actually pretty simple; if you launch your missiles we’ll launch ours. There’s no way to “win” the game unless one side possesses defensive measures to counter the other side. Here’s thinking Trump isn’t revealing all his military cards…our guns are bigger than theirs, right? The United States holds every advantage. Similarly Kim understands he can’t possibly wage a war against the United States and hope to hold power – or even live. The best he can do is stay alive and save his own rear-end by dealing with Trump. And for us, if trading “legitimacy” gets little rocket man to permanently put down his missiles in the short to medium term, it’s a price well worth paying. It almost looks like Kim appreciates the American political mind and how to deal with Trump better than some in the president’s own party. Tuesday’s South Carolina GOP primaries brought down another notable Trump critic, this time South Carolina Rep. Mark Sanford. Not being personally familiar with the dynamics of Sanford’s particular race it’s tempting to accept at face value Antle’s explanation for why Sanford lost in a party primary to someone who questioned the congressman’s loyalty to the president. On the surface one would think criticizing Trump (as “retiring” senators Jeff Flake and Bob Corker have repeatedly done) would equate to the kiss of death with GOP faithful, which polls show overwhelmingly back Trump and his agenda. It’s not just that Sanford did what he did – it’s how he handled the situation that makes him stand out. After reemerging from self-imposed obscurity, he came off as a love-sick pup who acted like a blushing teenager experiencing first love. His family fell apart and then his “soulmate” eventually dumped him (in 2014). Sanford managed to win now Senator Tim Scott’s House seat but never really reestablished himself as a reliable warrior for the conservative cause. In other words, there were plenty of reasons why Sanford’s district’s voters might have been looking for a change. Sanford’s on-again/off-again support for Trump might have been the last straw for people who couldn’t stomach his personal inconsistencies any longer. The “Sanford loses because of Trump” line sounds good but it seems like only part of the story where this case is concerned. We’ll see if the same pattern holds for other Trump critics. As far as the general election is concerned, Trump still may not be popular (in some circles) but it doesn’t look like he’ll drive voters into the Democrats’ camp. John Fund wrote at National Review earlier this week, “Of course, surprises are almost a daily occurrence in the Trump administration, and a series of nasty ones could shake up the current situation and again give Democrats a clear advantage. Trump’s trade wars could spook investor and business confidence and lead to economic uncertainty. The probe by Special Counsel Robert Mueller could unearth major developments and lead to surprising indictments. “But for now, Republicans can look forward to a climate in which the economy continues to pick up steam and the public is increasingly bored or unaffected by the Mueller probe. Democrats have put all of their chips on mounting ‘resistance’ to President Trump. They may find, however, that they should have spent the months after their stunning 2016 election loss in retooling their party so that it offered an updated, positive message rather than merely the sour rhetoric of an angry #Resistance movement. American voters aren’t stupid (at least the persuadable ones); they recognize a cheap sell-job when they see one. Trump may be many things but ingenuine isn’t one of them. Where Trump sees an opening he takes it, something Kim Jong-un is learning but some members of the GOP aren’t comprehending.